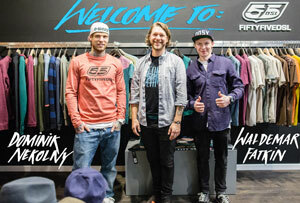 "We are happy to announce that our deepBMX teamriders Dominik Nekolny and Waldemar Fatkin signed a contract with their new clothing sponsor 55DSL!!! Congrats from our side to Dom & Wowa for their new sponsorship - you deserve it! Feel free to check the stylish clothing of the italian brand 55DSL on www.55dsl.com"
Congrats from us as well and great to hear that 55DSL stays involved with flatland after sponsoring the 55DSL Jam in Berlin, Germany last year.